Savory Tomato Cobbler – it’s hard to come up with enough superlatives to describe this wonderful, delicious, slightly sweet, savory, rich and absolutely delightful Tomato Cobbler direct from our garden to the table! This is seriously one of the best tomato dishes I’ve ever made … strike that. This is one of the best things I’ve ever had for dinner eaten. All day I’ve tried to come up with the proper superlatives to describe this wonderful, delicious, slightly sweet, savory, rich and absolutely delightful Tomato Cobbler direct from our Garden to Table! Oh my goodness – fresh homegrown tomatoes, vibrant savory thyme, a little heat from cayenne and just a touch of tangy-ness from the whole-grain mustard … we are in love! These heirloom cherry tomatoes are not from our garden but I’m planting some next year! Amazing little fruits. 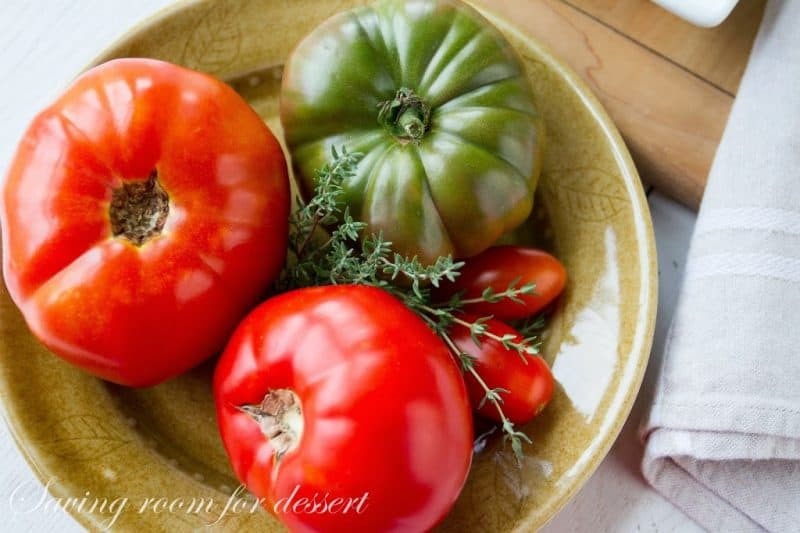 For this recipe I used a variety of large heirloom tomatoes, a few grape tomatoes and fresh thyme from our garden. We love all the tomato varieties we planted and harvested this year. This is the first time we’ve grown mail-order plants and are very pleased. We weren’t crazy about the same old varieties found at the big box store year after year. These arrived super healthy and produced as promised. We also worked extra hard to keep the entire garden completely organic. We’re crazy about fresh tomatoes! For this recipe I used three large tomatoes and 2 cups of cherry tomatoes. The biscuit dough is thick with a generous helping of fresh thyme and whole-grain mustard. I used an ice cream scoop to place the drop biscuits on the tomato, onion and garlic mixture. My husband took one bite then asked if we could just grab a couple of spoons and finish it off. I told him this was supposed to be 6 servings. He went on to say that one beer is a serving but that doesn’t mean you always stop with one. Good point. We enjoyed this so much I can’t wait to make it again. 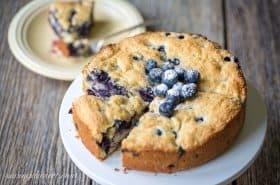 Please give this simple, rustic amazing cobbler a go – it is fantastic! 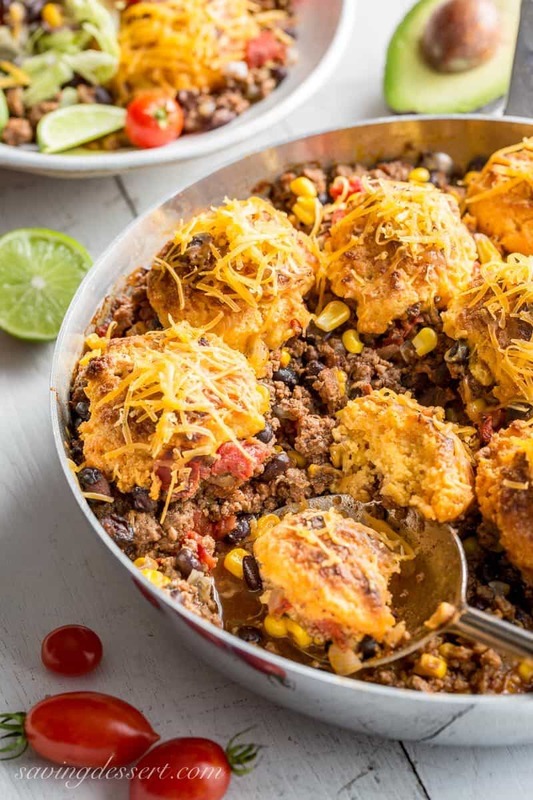 Skillet Taco Cobbler ~ ground beef, black beans, tomatoes and corn come together in a nicely spiced base for tender, cheesy cornmeal biscuits. 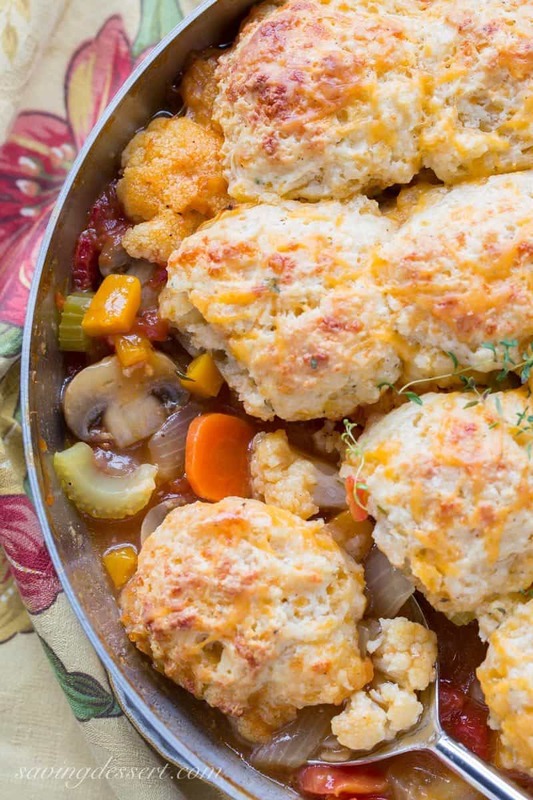 Savory Winter Vegetable Cobbler with Cheesy Herbed Biscuits ~ a delicious and hardy vegetable dish loaded with mushrooms, cauliflower, butternut squash, onions, carrots and celery. Topped with a soft cheesy biscuit to soak up all the juice! 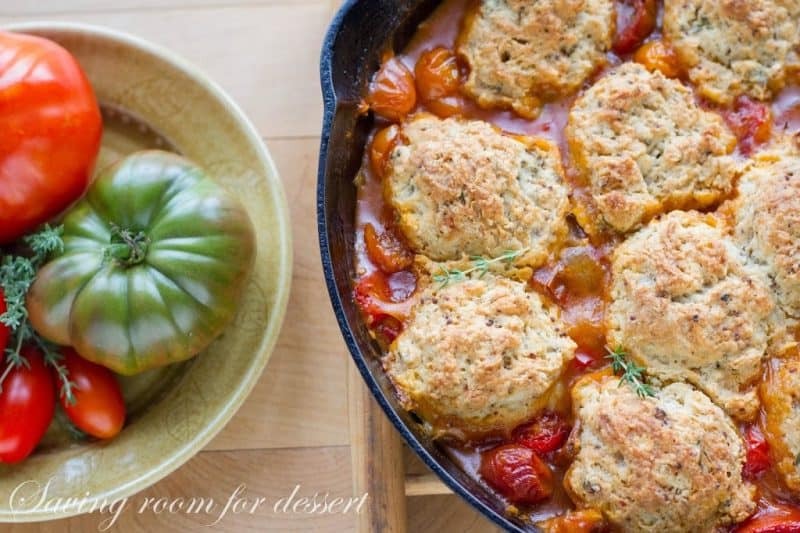 Savory Tomato Cobbler - it’s hard to come up with enough superlatives to describe this wonderful, delicious, slightly sweet, savory, rich and absolutely delightful Tomato Cobbler ... direct from our garden to the table! To make the tomato filling melt 2 tablespoons butter over medium-high heat in a large oven-proof skillet. 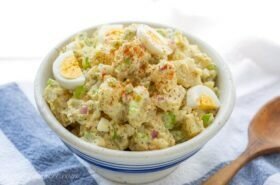 (See NOTE below) Add the chopped onion and cook, stirring occasionally, until soft and light brown, about 5 minutes. Add the garlic, thyme and cayenne pepper. Cook and stir for 1 more minute then add the chopped tomatoes, brown sugar and 1 1/4 teaspoons salt. Bring to a simmer and cook just until the tomatoes start to soften, 4-5 minutes. Do not overcook. 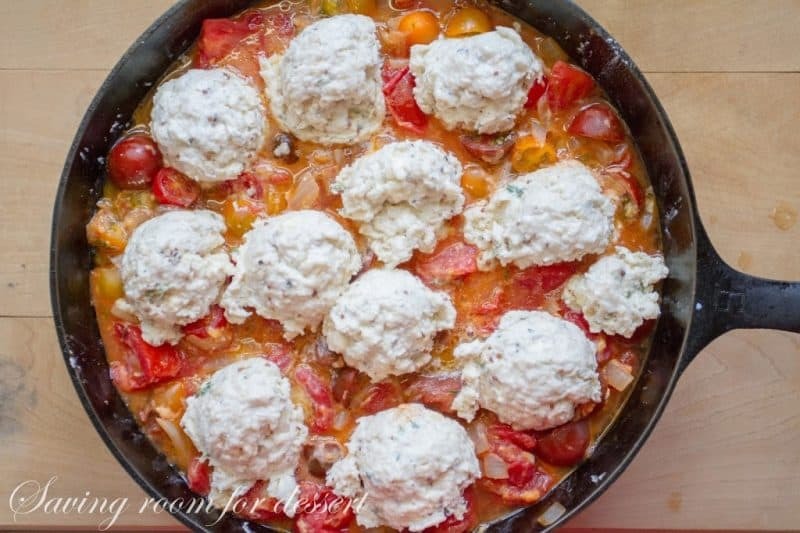 Remove the skillet from the heat and gently stir in the flour and cherry tomatoes. Dot with the remaining 1 tablespoon of butter and set aside. To make the biscuit topping whisk together the flour, baking powder, granulated sugar, 3/4 teaspoon salt and black pepper in a medium bowl. Add the sliced butter and using a pastry cutter, blend the butter into the flour until it resembles coarse meal. 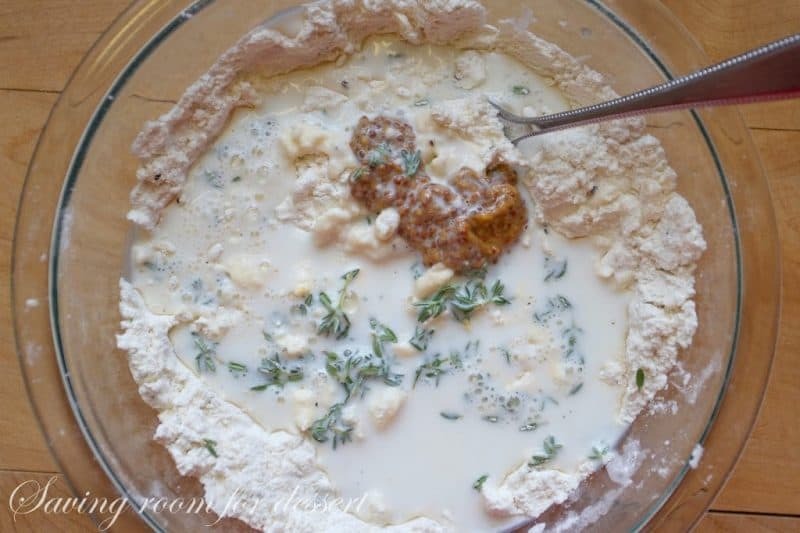 Add 2/3 cup of milk, the thyme and mustard to the flour mixture. Gently stir with a fork just until a sticky dough forms. To do over mix. Using an ice cream scoop, drop balls of dough over the filling. 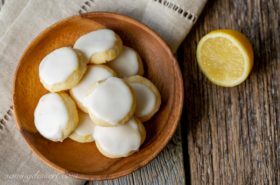 Brush the dough balls with milk and bake until the biscuits are golden brown and the filling is bubbly - about 55-60 minutes. Allow the cobbler to rest about 15 minutes before serving. As you may know, we really shouldn't cook tomatoes in cast iron as the acidity can strip the seasoning on your pan. Use stainless steel or enameled cast iron or even a regular casserole dish. No doubt this Buffalo Chicken Cobbler must be fantastic. Check it out over at Lemons for Lulu. I’ve also taken the classic Chicken Pot Pie and turned it into a savory cobbler with Herb Biscuits. So much easier than rolling out the dough. Hope you’ll give a few a go in your kitchen! 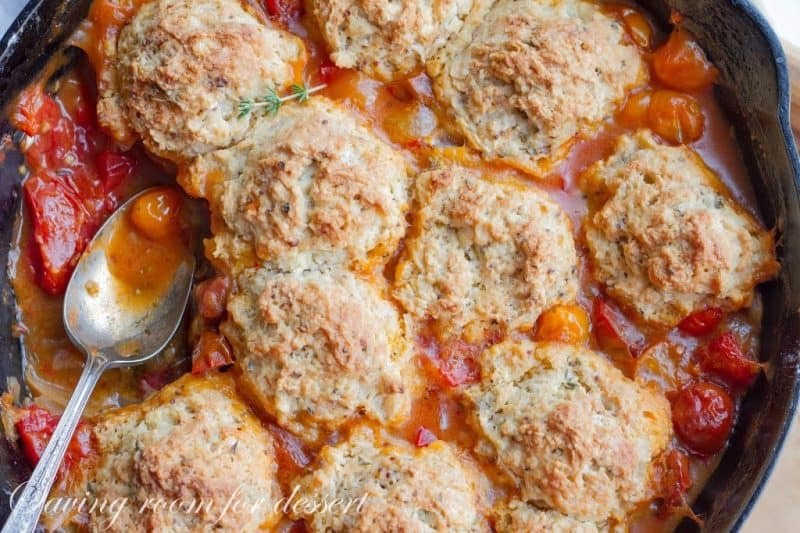 This recipe for Tomato Cobbler really is crazy good. Use good ripe tomatoes and fresh thyme. You won’t be sorry! Hope you have a wonderful weekend and thanks so much for stopping by! Beautiful dish! I always love garden-to-table meals. 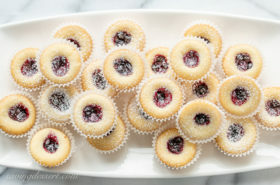 Your blog is amazing, are you interested in becoming our recipe partner? I pinned this before I even commented 🙂 I can’t wait for my tomatoes but they are still just blossoms yet! This looks absolutely delicious, Tricia, and I always grow thyme in the summer too. Wow! This looks superb! And you do a lot of good stuff, so if this is one of the best things you’ve eaten, I’m definitely taking notice! Thanks so much for this. You’re going to LOVE it John! One of the best things I’ve ever made – especially if you love tomatoes. Thanks so much for stopping by. I do love your husbands logic Tricia, makes perfect sense, especially for such a taste explosion mouth watering dish! Thanks Mandy! Leave it to husbands to be logical 🙂 Happy travels! Wow! 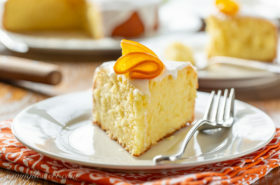 What a delicious savory twist on a sweet classic! I will definitely be making this soon! I know you are going to love it! We do 🙂 Thanks for stopping by! Now I wonder what happened to my tomato plants? You already harvested so many beautiful tomatoes and mine are still so tiny. The cobbler looks heavenly, Tricia. How gorgeous is This dish!? My homegrown tomatoes are but blooms right now..but I will try this..thank you. Tomatoes are coming soon Monique – hope you give it a try! What an ingenious recipe! I’ve never had a savory cobbler but what a great idea Tricia. I also wasn’t aware of the issue between cast iron and tomatoes. Great tip. Thanks Toni – the cobbler didn’t bother my skillet but I guess if I made this a bunch of times – it may need re-seasoned 🙂 Have a great week! This dish is so pretty and I absolutely know I would love it. It’s right up my alley 🙂 Off to find some heirloom tomatoes! This looks lovely. What a great idea to make a savory cobbler. Thanks Gerlinde! Have a great week! I’ve never had tomato cobbler, but this does sound delicious! It is Bianca – hope you give it a try. We were thrilled and can’t wait to try it again. I knew that it was a keeper just by looking at the photos. Wow! With your superlative description I cannot help but make this fabulous sounding dish sometime very soon! I can’t wait for some local tomatoes and I’ll be all over it. Thanks Tricia, it’s beautiful too! Thanks Chris – it is a perfectly tasty dish and I can’t wait to make it again. One word for this recipe ‘genius’. Can’t wait to use the many other words that will be inspired once I make this and taste it. Thanks. Thank you so much Judy. It is absolutely amazing – really, really great. I look at our organic garden and all those happy tomato plants and just can’t wait to pick fresh tomatoes and make this again! Thanks for commenting and stopping by. I know you will love it. This is a "must make!" I don't have your gorgeous heirlooms in my garden, but I know where to find them! I've cooked tomatoes in my cast iron before, but never knew it wasn't good for it. Somewhere I've heard that it adds iron to the tomatoes. Who knew? Does the tomatoes react to the cast iron pan ? I have always been told not to cook tomatoes in a cast iron pans. My two cents about using cast iron-cooking any recipe with tomatoes causes some of the iron to leach out of the pan. The best spaghetti sauce comes from a cast iron skillet! As far as having to reseason the pan-if you are using it, you will eventually have to reseason. Enjoy the cast iron and if you don’t have one you definitely need one in your kitchen. Great recipe. I will watch my pan and skip tomato dishes I guess 🙂 Thanks for the info! This looks so amazing we will definitely put this one on our list of things to make – thanks for the recipe! Have a great weekend!! 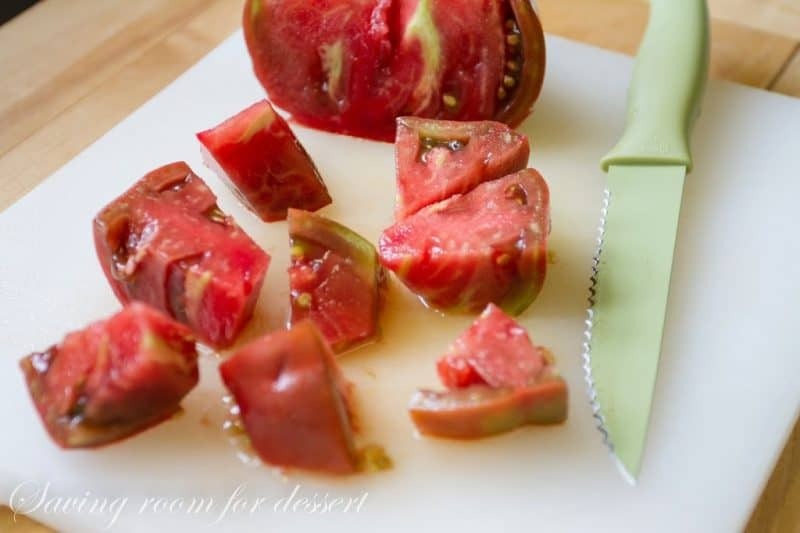 This is going on my list of things to try when my large tomatoes start to ripen. I have lots and lots of big green tomatoes and my foot is tapping 🙂 It really looks delicious with those drop biscuits on top! This looks amazing Tricia, I can see my you loved it. 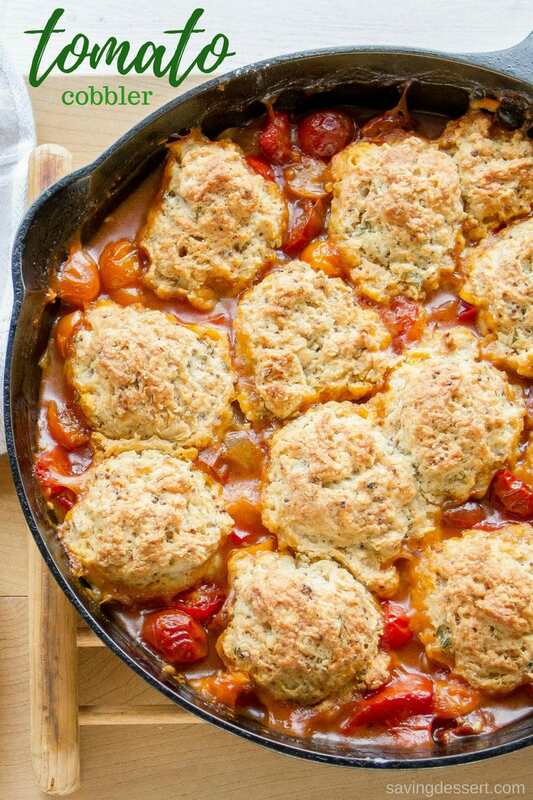 I never thought of a tomato cobbler but it's an awesome idea. Those tomatoes are gorgeous! I am SOLD, Tricia. Your homegrown tomatoes are sensational! Mouthwatering clicks!! Looks amazing, Tricia! 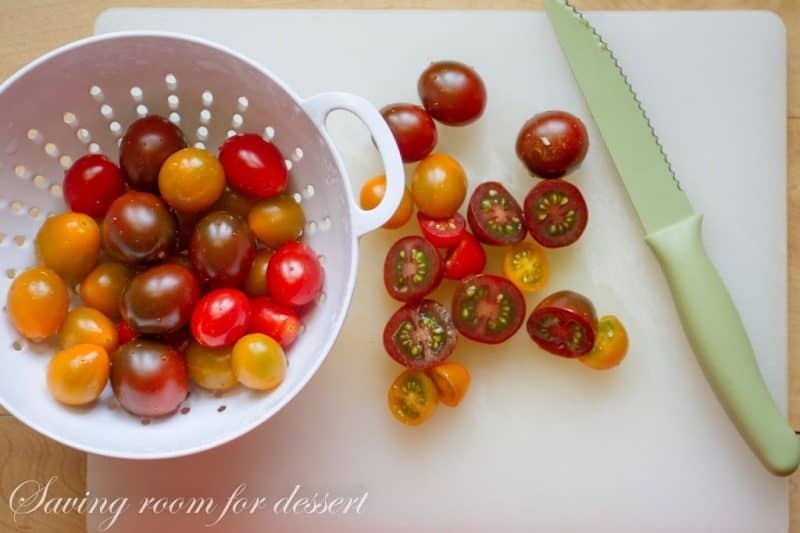 What a fantastic way to enjoy seasonal tomatoes. And I'm so intrigued by the biscuits with thyme and mustard. Sounds and looks so good…the amazing-ness of this totally comes through in your photos! I think I'd get along with your husband just fine. His logic is one I can relate too. this looks totally fabulous and i trust your judgement. Back when we had a garden I always used to mail order seeds and such.It was worth it. Thanks, Tricia. I feel like I just won the lottery! Seriously! This dish looks AMAZING! I can only imagine how good this must taste! This is such a creative dish! LOVE it! Hi Tricia, I am scrapping what I was going to make for dinner tonight and making this, I can't believe it I have everything, LOVE THIS DISH!!! Hi Tricia, wanted to let you know that I did make this and it turned out perfectly, my husband and I loved it! Looks delicious Trish – Great use of summers bounty. You have me sold by the photos alone. SO GORGEOUS!!! I've got a crisper drawer full of tomatoes. Thanks for this recipe.